Don't retype your documents – convert them! OmniPageamp;reg; 18 is the fastest and most precise way to convert paper, PDF files, and even digital camera pictures into documents you can edit in your favorite PC applications. 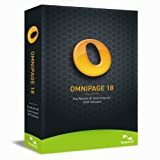 OmniPage 18 delivers unrivaled accuracy, speed, and innovative features.As the industry-leading solution, OmniPage 18 delivers the most accurate document conversion available, turning paper and PDF files into electronic files you can edit, search, and share. In addition, OmniPage 18 ensures that your converted electronic documents look exactly like the original – complete with text, graphics, columns, and tables.